Price drops are the norm in app business. Developers are keen to slash prices of their digital warez, mostly for a limited time, in order to boost revenue. Some apps even go from paid to free permanently in the hope of raking in more revenue through in-app purchases. Just a few recent examples: Evernote has temporarily made the Penultimate handwriting app free and National Geographic’s World Atlas for the first time has gone free. Research firm Distimo has a report out which proves that iPhone app price drops on average grow revenue about 159 percent in seven days. As such, price drops are an effective short term marketing tool to boost earnings. 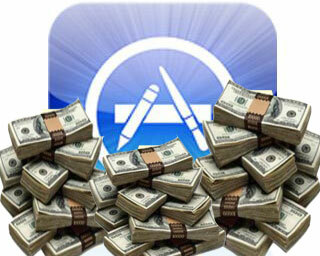 The survey found that 850 iPhone apps and 930 iPad apps changed their price at least once in December 2012. Surprisingly, price drops have more dramatic effects on iPhone apps than their iPad counterparts, which typically carry a notable premium. Distimo explains that revenue from one-off fees and in-app purchases both contribute to this increase in revenue in the long run. The research firm discovered that price cuts grew iPhone app downloads by 1,665 percent (871 percent for iPad downloads). The majority of these price changes are within a $1.00 to $3.00 range, the largest being for iPad apps. Specifically, twenty percent of all price events involved a change larger than $4.00 in the iPad App Store. The effect on downloads of a lower price ends, when the price increases again. 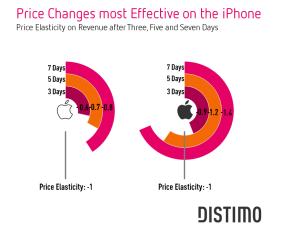 Download volumes in the Apple App Store for iPhone drop by -46 percent, aggregated over five days after a price raise. In the Apple App Store of iPad, the drop in downloads is somewhat higher, -57 percent. The iPhone App Store has the lowest elasticity, meaning that revenue reacts most heavily on any price change in this store. 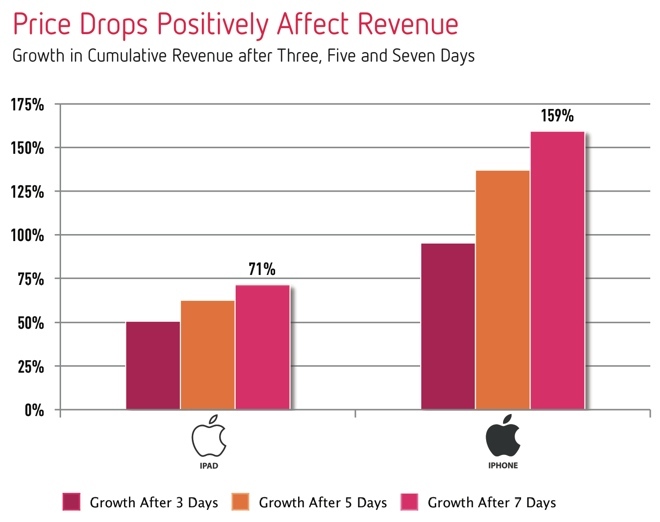 For iPhone apps, a one percent price drop leads to a 1.2 percent revenue increase within five days (0.7 percent for iPad apps). 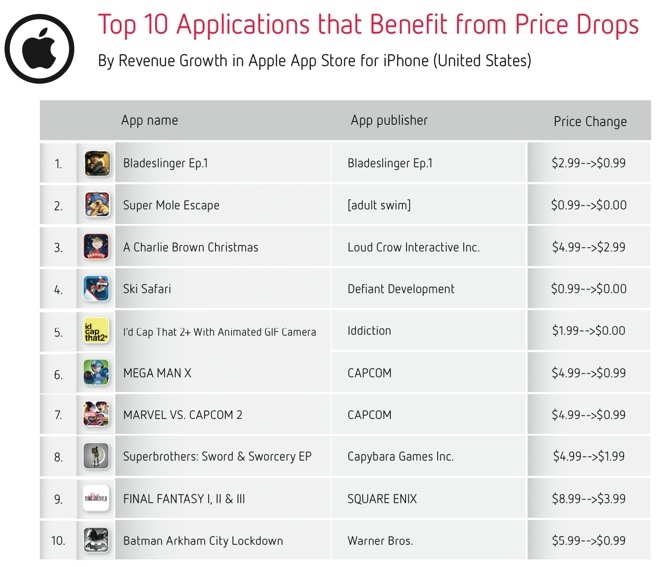 The App Store hosts a number of specialized apps that make it easy to track price changes. My favorites, for example, are AppAdvice and AppShopper. 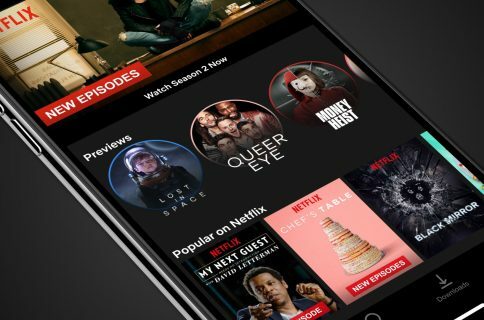 These programs typically let you define custom criteria to track price changes and put your favorite apps on a watch list, with alerts when prices change or apps go from paid to free. How do you track app price changes?